The National Defence Commission of the Democratic People's Republic of Korea (NDC) (Chosŏn'gŭl: 조선민주주의인민공화국 국방위원회) was the highest state institution for military and national defence leadership in North Korea, which also served as the highest governing institution of the country from 1998 until 2016 when it was replaced by the State Affairs Commission. The National Defence Commission started as the National Defence Commission of the Central People's Committee of the Democratic People's Republic of Korea (Chosŏn'gŭl: 조선민주주의인민공화국 중앙인민위원회 국방위원회) which was created on 27 December 1972 by the 1972 Constitution as one of the commissions that were subordinate to the Central People's Committee. 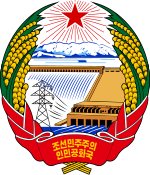 The commission was separated from the Central People's Committee on 9 April 1992 through an amendment of the 1972 Constitution, and became the National Defence Commission of the Democratic People's Republic of Korea. It was also designated as the "supreme military leadership institution of state power." The National Defence Commission became the highest governing institution in North Korea on 5 September 1998 through an amendment of the 1972 Constitution that abolished the office of President of North Korea. It was designated as the "supreme military leadership and overall national defence management institution of state power." Since an amendment of the 1972 Constitution on 9 April 2009, the National Defence Commission was designated as the "supreme national defence leadership institution of state power." The National Defence Commission continued to be the highest leadership body in North Korea until 29 June 2016 when an amendment to the 1972 Constitution created the State Affairs Commission of the Democratic People's Republic of Korea (Chosŏn'gŭl: 조선민주주의인민공화국 국무위원회), which was designated as the new highest leadership body in the country, with the National Defence Commission being disbanded to be convened only during times of war. The 1972 Constitution mandated the National Defence Commission to be one of the commissions that are subordinate to the Central People's Committee in order to assist it in its work. The National Defence Commission is responsible to the Supreme People's Assembly. As a defense issues guider and coordinator, the security organizations in North Korea are subordinate to the Commission and among them are the Korean People's Army, the Ministry of People's Armed Forces and the Ministry of State Security and the Ministry of People's Security. From 1972 until 2012, the National Defence Commission consisted of a chairman, first vice chairman, vice chairmen and members. The Chairman of the National Defence Commission was the head of the commission, and was the de facto highest official in North Korea from 1998 until 2009 and the de jure supreme leader of North Korea from 2009 until 2012. The chairman of the National Defence Commission also served as the supreme commander of the Korean People's Army. From 1972 until 1992, the President was the ex officio chairman of the National Defence Commission. Since 1992, the chairman of the National Defence Commission was no longer required to be the President and was elected by the Supreme People's Assembly. The first vice chairman, the vice chairmen and the members of the National Defence Commission were elected by the Supreme People's Assembly based on the proposal of the President from 1972 until 1992, and by the chairman of the National Defence Commission from 1992 until 2012. In 2012, the position of chairman of the National Defence Commission was replaced by the First Chairman of the National Defence Commission following an amendment to the 1972 Constitution that enshrined Kim Jong-il as eternal chairman of the National Defence Commission after his death in 2011. The same amendment also mandated that the National Defence Commission also consisted of vice chairmen and members, which were elected by the Supreme People's Assembly based on the proposal of the first chairman of the National Defence Commission. For a complete list of members since 1998, see List of members of the National Defence Commission. Kirby, Michael Donald; Biserko, Sonja; Darusman, Marzuki (7 February 2014). "Report of the detailed findings of the commission of inquiry on human rights in the Democratic People's Republic of Korea - A/HRC/25/CRP.1". Archived from the original on Feb 27, 2014. Robbers, Gerhard (2007). "North Korea: The National Defense Commission". Encyclopedia of world constitutions. Infobase Publishing. p. 490. ISBN 978-0-8160-6078-8.